Welcome to Dún Laoghaire! This laid-back seaside town, just South of Dublin is our starting point for our 11-day tour of Ireland. 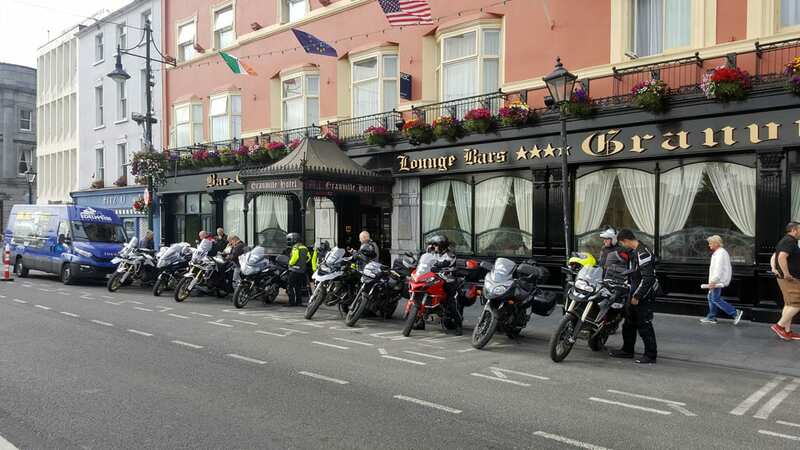 Our group, consisting of riders from the US, Canada, Austria and Germany are all seasoned travellers and have arrived here over the last two days to take part in Edelweiss’ “Ireland and the Wild Atlantic Way Tour”. Any signs of nervousness about meeting an unfamiliar group of people is soon overcome with the aid of a few pints and tales of past travels. For many of us on this tour it is the first time visiting Ireland and we can’t wait to get going! It’s early summer in Ireland and everything is in full bloom. Even our helmets seem to be more colourful than usual. Our tour takes us around the island, first North across the border and through the Mourne Mountains to Belfast, the capital of Northern Ireland. Here we join the Causeway Coastal Route, one of the most stunning roads to be found anywhere in the British Isles! Beautiful views of the Irish Sea, fantastic sweepers and at the end the Giant’s Causeway, a must-see for any visitor to Northern Ireland. 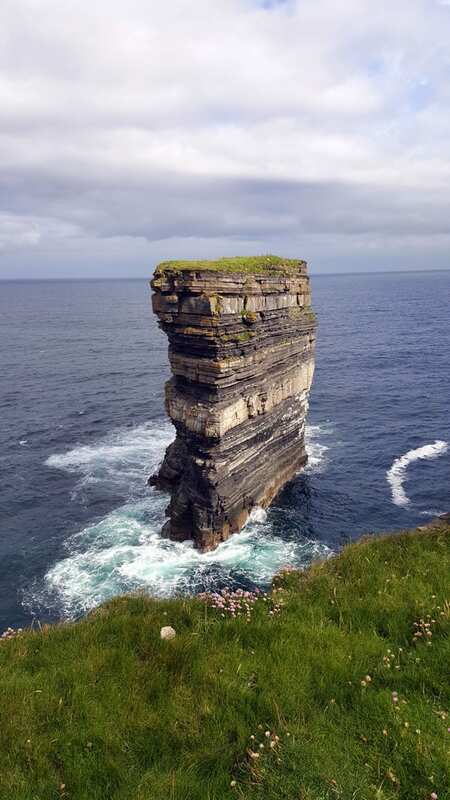 Downpatrick Head, a remote spit of land far away from the tourist routes. One of the most serene moments of trip, beautifully silent, apart from the ocean winds and a few seagulls. From here we head back into the Republic of Ireland, towards the small town of Letterkenny and another highlight of the tour. 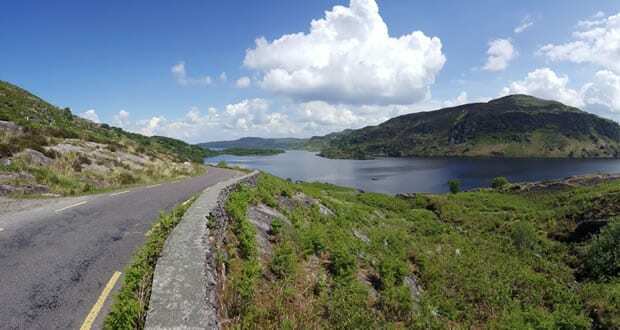 The Wild Atlantic Way (WAW) stretches over 2500km along Ireland’s western coast, hugging the shore wherever possible, and offers some of the best riding to be found anywhere in Europe. We join the WAW at Dunfanaghy, where a small single lane road takes us out towards Horn Head for some of the most stunning views of the tour so far. Horn Head offers a first amazing view of the Wild Atlantic Way! Sitting high up on the cliffs overlooking the deep blue (and it really is blue!) of the ocean, watching one of the small local fishing boats haul up crab pots, fills us with a deep sense of calm and relaxation. Irish sheep are calm, friendly and not too fazed by our passing. Unless, of course, one of our Multistradas revs its engine. The next few days are packed with an almost endless variety of ocean views, small mountain passes and peat-filled moors as we make our way south on single lane roads full of twisties and switchbacks. And all in glorious sunshine! The WAW is our constant companion as we ride past Croagh Patrick and through Doo Lough Pass, another fantastic single lane road, almost empty of traffic and full of spectacular views. 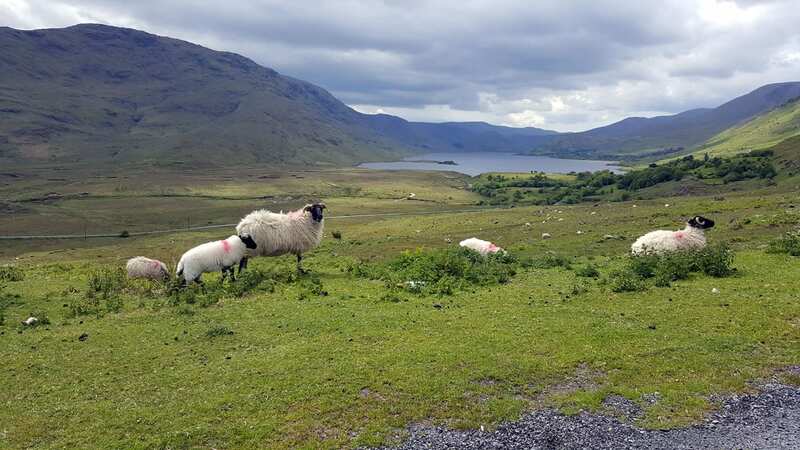 Sometimes you just have to stop and take in the view of beautiful Connemara. Our next stop is Galway, home to the Latin Quarter and some of the best pubs and live music to be found anywhere in Ireland. But it’s not just the fantastic nightlife that makes Galway such an attractive stop for travellers from all over the world. Heading North we tackle the roads of County Galway on one of the best rides of the trip so far. Rough and grippy tarmac snakes its way past lakes and through valleys, full of hidden dips and turns that make for an exhilarating ride! A quick coffee at Kylemore Abbey, one of Irelands most famous stately homes, and we head out onto Sky Road for unparalleled views of the craggy Connemara coastline. Back in Galway we park our bikes at our hotel and head into town for an evening dedicated to sampling some of the many delights a good Irish pub has to offer! 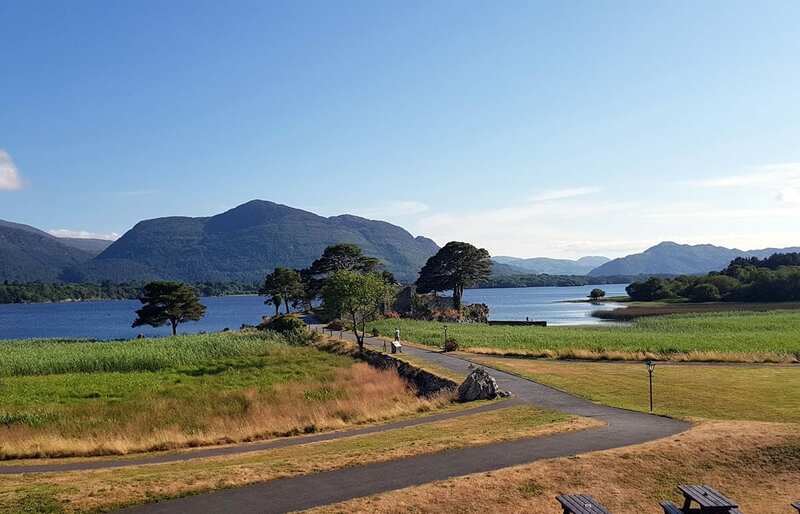 Killarney National Park in glorious sunshine. We can’t believe how lucky are. The next morning dawns and it’s time to say goodbye to the sights and sounds of bustling Galway. 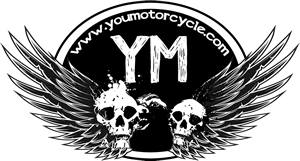 We ride South along the Bothar nA hAillite Coast and make our way to the famous Cliffs of Moher. Unfortunately, Ireland’s famously wet weather comes into effect (the only time on this trip) and thick, wet fog blankets the cliffs, reducing visibility to a few metres at best. So we press on and take the Killimer- Tarbert ferry across the River Shannon and into County Limerick. Heading into Killarney the skies begin to clear and we are treated to a spectacular sunset over Lough Leane and the mountains of Killarney National Park. The Gap of Dunloe offers some of the finest riding anywhere in the world. If you like single lane roads, that is (and who doesn’t). After a well-deserved rest at out lakeside hotel we set out on one of the best rides of the tour so far. We make our way into the Gap of Dunloe, a tiny single lane road that runs between MacGillycuddy’s Reeks and the Purple Mountains. This road is a riders’ dream, a never-ending sequence of tight turns, sharp rises and hidden dips, seemingly designed for motorcycles! Passing through the gap we descend into the Black Valley for even more twisties and finally reach the coast. After a coffee at a beautiful riverside café in Sneem we join one of the most famous roads in Ireland, the Ring of Kerry. This narrow, 180km long circular road along the coast of County Kerry is without a doubt one of the most beautiful roads anywhere in Ireland. Balagh Beama Gap, one of the highest mountain passes in Ireland. The extremely narrow road is impassable for anything larger than a small car. More fun for us! The only problem we face is to not loose track of time as we force ourselves not to stop at every single stunning viewpoint. After an excellent lunch of roasted lamb and crab claws we say goodbye to the Ring of Kerry and head inland into the heart of MacGillycuddy’s Reeks. The roads are devoid of traffic as we climb into the mountains and as we reach the summit at Balagh Beama Gap, one of the highest mountain passes in Ireland, we turn off our engines and take in the breath-taking views of the narrow valleys and moors that surround Carrauntoohil, the highest mountain on the island. Our day ends with an excellent pub meal and plenty of laughter as we reflect on an epic ride. The entrance to the Glendalough monastery is decorated with a large cross carved into the side of the arch, bestowing a blessing on all travellers that pass through its gates. Soon it is time to move on. Heading east we head for Blarney Castle, home of the legendary Blarney Stone and then take the road-less-travelled on our way to Waterford. Once again, the roads are almost empty, with most traffic sticking to the many highways that crisscross the island. We are most grateful! After a restful night in Waterford it is time for our last days’ ride in Ireland. 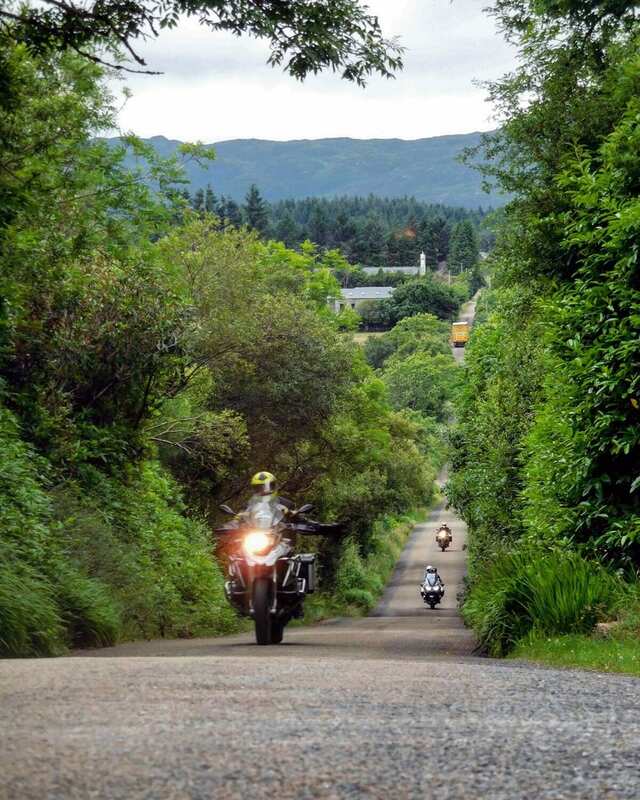 Ireland is just full of excellent small country lanes that are just made for motorcycles. Sweeping country roads take us to Glendalough, one of the many great early Christian monasteries that shaped so much of Irish history and culture. We wander through the ruins of the monastery, marvelling at the tranquillity of this beautiful site. But the day is not just about culture and history! Just south of Dublin lies Wicklow Mountains National Park and in the middle of it Sally Gap, a beautiful pass road just begging to be ridden on a high-powered motorcycle. Good thing we came prepared. Getting ready to depart from the Granville Hotel in Waterford, birthplace of none other than Thomas Francis Meagher, the man responsible for the Irish National Flag. Heading down the mountains we see Dublin spread before us and as we tackle the last few kilometres to our hotel we all feel the temptation to turn around and do it all again. We will be back! You can find out more about the Ireland and the Wild Atlantic Way tour here, or check out Edelweiss’ Eastern European tour or Japan tour.